In the current atmosphere of controversy about modes of interpreting literature, historical influences in science, and subtle ideologies in social theory, Abraham Edel confronts the institutionalized separation of the humanities and the sciences, the segregation of disciplines through structures that rest on entrenched dualisms, and the isolations reenforced by habits of the academy and its struggles over turf. Edel's "search for connections" - carried out not only theoretically but through a series of particular studies spanning major disciplines from philosophy and social theory to jurisprudence, biography, and cultural anthropology - leads into uncharted waters. He faces the startling conclusion that the clue to answering internal questions characteristically turns out to come from trans-discipline relations. 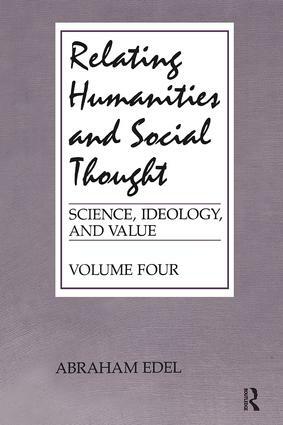 This fourth volume of Edel's Science, Ideology and Value focuses in a Deweyan vein on the functional requirements at the base of the social sciences and humanities alike: discipline structures are subject to change, development, and decay, and even to categorial shifts as well as to readjustments. At the same time, Edel's philosophical nauralism helps diagnose the obstacles to research that stem from imposed dualisms such as theory and practice, subjectivity and objectivity, fact and value, individual and society, as well as social contrasts of elite and mass. Normative structures are to be held responsible to inquiry, and a self-conscious exploratory practice is needed to minimize the risks of arbitrary closures. For those who wish to get beyond sloganeering in the world of education, humane learning, and the social and historical sciences, this book is a must. Is the Individual-Social a Misleading Dichotomy? What Place for Philosophy in Contemporary Thought?